Giacomo Puccini’s final opera, “Turandot,’ debut 1926, librettists, Giuseppe Adami and Renato Simoni, at La Scala opera house, Milan, Italy, is admirably showcased with the wizardry of Pacific Symphony’s imaginative concert production running February 18, 20 and 23, at the Segerstrom Concert Hall, Costa Mesa, California. It is a show that surprises, entertains, delights and thrills to the combined talents of singers, orchestra, video designers and dancers. With the full orchestra on-stage, conducted by Carl St. Clair, the Pacific Chorale arrayed above, the Southern California Children’s Chorus, adding unexpected luminary delights and video images of China reminiscent of Hollywood Cinemascope. Directed by Eric Einhorn, “Turnadot” grabs the audience in an embrace of extraordinary Puccini music, Including the world-famous aria “Nessun dorma,” sung by Prince Calaf, played by tenor, Marc Heller, as he promises himself victory in winning the princess. The aria has become known as the signature for the late Italian tenor Luciano Pavarotti. Based upon a 12th century Persian fairy tale, “Turandot” (the final t is pronounced) transported to ancient China, where the Princess Turandot lives imprisoned in self-imposed hatred of men seemingly to avenge the abduction and murder of her ancestor of a thousand years ago. Not really a love story in the tradition of Puccini’s other reknowned heroines such as Tosca and Madama Butterfly, nor a tear-jerker such as “La Boheme,” where doomed Mimi steals the show which is more concerned with the careers and loves of four young men beginning their careers in Paris. 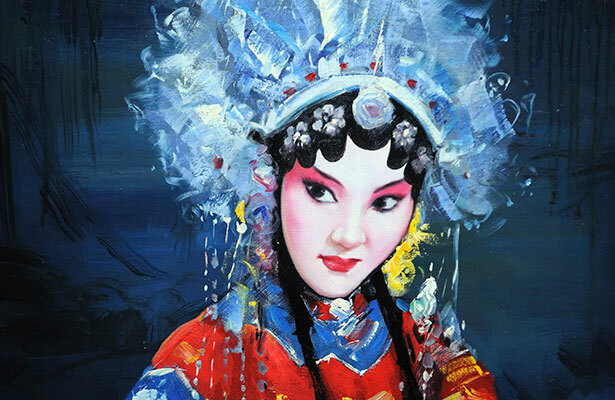 “Turandot” is more a psychological study in misdirected emotions. Puccini came from a musical family in Lucca, Italy. He knew women. With five sisters and a widowed self-assured mother who wrote to Queen Margherita of Savoy for a music scholarship for her son, Giacomo, women were understood and valued. He was awarded a royal scholarship and it is said after seeing Vedi’s “Aida” opera became his life. “Turandot” continues the tradition: Elizabeth Caballero, soprano, is spectacular as Liu, devotedslave to Timur, vanquished king of Tartary, sung by bass Hao Jiang Tian, and father of Prince Calaf. Without the overpowering traditional pageantry of a fully staged and costumed production the character of Liu emerges more vividly. Caballero does her proud.Court officials Ping, Pang and Pong, are played by Dan Kempson, Jonathan Blalock and David Blalock, with deft control exposing their job-whining longing to return to their pastoral homes. Apparently no one wants to work where severed heads are part of the job – thanks to black-clad executioner, danced sensuously by Melody Yao. Tamara Mancini, soprano, Turnadot, does not appear until Act II. She sings a rather brief – 25 minutes – but demanding role. Her father, Emperor Altoum, played by tenor Ronald Naldi, insists she marry. Prince Calaf’s determination to wed her is unpopular with everyone. Yet, he finally unlocks her heart once Liu’s poignant declaration of love for Calaf has inspired respect for love over revenge. Some of the creative talents for this opera production are: John Alexander, Pacific Chorale, artistic director; Robert istad, assistant conductor and chorusmaster; Lori Loftus, Children’s Chorus director and Paul DiPierro, digital media designer. Special recognition must go to the creative team which utilized Chinese New Year lanterns in such charming ways. Patrons were initiated when entering the lobby festooned with hand-made laterns symbolizing a way for people to let go of burdens of old selves and express best wishes for the future. Turandot – Feb. 18, 20, 23 – 8 p.m. Journalist and Opera Pacific docent. She covers entertainment, culture and travel and resides in Orange, CA.